It was an amazing game with a completely unpredictable result! That was fun, and one sided. Again using those dice with Aquila symbols on 1's, I am used to them now though. Dont stand the warrior priest next to the wizard, if he miscasts the priest might be hurt. Thank you for your tips and comment! I am forgot about warrior priest and wizard! I am agree with you, if wizard miscast and warrior priest beside, him will hurt! 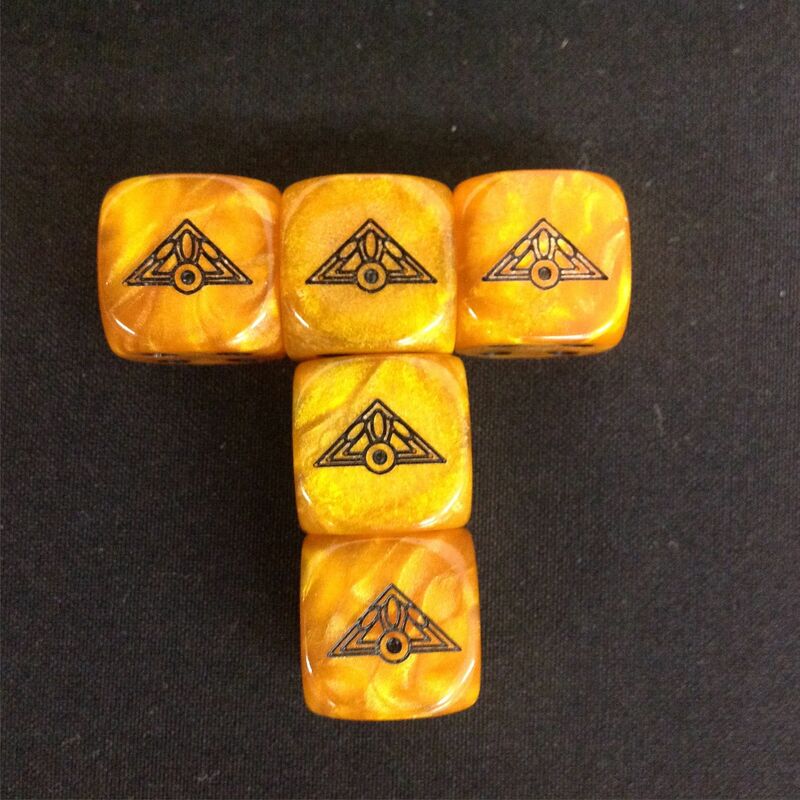 These are dices from a Talisman board game with a talisman symbol! Cool game. Can tell it’s getting heated when dice fly off the dice tray. Give the Speculum to the wizard unless you have a magic weapon on the priest. The priest as swapped stats are still dangerous to itself, a wizard on the other hand. Use the Speculum to challenge an infantry miniature. A lvl 1 wizard (on a horse) with speculum is a good backup caster and can run alone into units with characters and challenge. Khornates must accept!! when applicable cast prayers on 1 dice to draw out dispel dice before your wizard casts. Lost focus will not effect the wizard. When facing Khorne or other armies with no missiles you don't need to put the wizard in a unit, especially if your wizard get spells you want to cost on lots of dice and get Irresistable force. You can place the wizard in a small skirmish archer unit, no models are in base contact, few are in the blast area and yet you keep look out sir. This is good against any opponent. A small unit of skirmish archers could cost about 50pts of core and be useful of itself. You can use the same models as huntsmen if you want something more shooty, but you will not be able to use all their abilities if a caddy for a wizard. Decide what you want after you have rolled for spells, if you get big spells keep the wizard alone or with archers, if you get small safe spells you can place him in your main unit. Hordes of halberdiers are less valuable than they look, use them in deep ranks, especially against tough opponents like chaos warriors. the wider your force the more enemy get to attack, and they are invariably better than your halberdiers. 5 or 6 wide is good enough. Ogres will help, but are problematic, standard ogres are not powerful enough to face chaos, use Ironguts or Leadbelchers for best effect. Ironguts can deal with the nasty stuff and are tough enough to live long eonugh to swing. Leadbelchers are like ordinary ogres, reasonable in combat but they have a good shooting attack. However they do not stand and shoot, but they are still worth the investment. Maneaters are to expensive to field, nasty on paper but will take too much away from your army to field. A warpriest can pray for ogres. Wow! I am very grateful to you for the efficient and necessary advices! In the next battle I will try use you advices! Don't make large units of Marauder horse as combat blocks, they so not work. Use chaos knights instead, even a single rank is enough. Warhounds are good for tying up warmachines and missile units. Marauder infantry in units of 20 are good support units, they do well against normal Empire troops and are reasonably cheap, dont buy them marks just flails or shields. Keep them cheap. Chaos trolls are worth having, because they are resistant to shooting. Dragon Ogres and Chaos Ogres are more risky but can work. Chaos warriors themselves work well with just sword and shield and no marks but used in larger combat blocks. Marks work but your troops are already superior you don't need to buff them further, but marks are worth it. Tzeentch and Nurgle in particular offer more in survivability than they add in cost. It is easy to overspend with chaos, a lot of upgrades are overkill and you can do as much with less.. Many thanks for your comments! You always give useful and necessary advices!